You will have seen the message from Sally Hunt with the HE ballot result and the confirmed dates for strike action 25th and 26th May. This will be followed by members working to contract with effect from 25/05/2016. Full guidance will be issued this week on what you should and should not do. 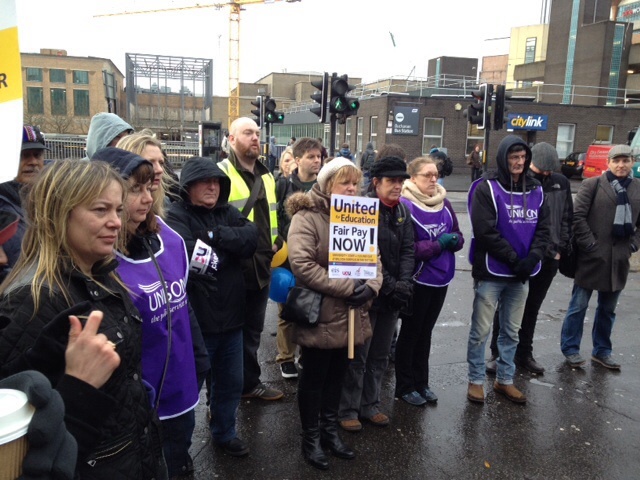 No UCU member takes action lightly but since 2009, the cumulative loss to our pay (compared to rises in RPI) is 14.5%. Despite it being 50 years since the Equal Pay Act, the continuing gender pay gap in UK higher education is shameful – the total gender pay gap currently stands at a staggering £528 million. Even at GCU, which is not the worst offender, the recent analysis of basic pay was able to show the overall pay gap favouring males was the following in each category: Campus services 24.7%, Academic 8.2%, Professional and Admin support 6.0%, Technical 5.0%, Senior managers (academic) 10.6%. The latest reported figures from HESA showed that the sector has over £1 billion in operating surpluses. Widespread casualisation in the sector impacts on all staff terms and conditions and the rate of pay – according to HESA , there are 75,000 staff on highly casualised ‘atypical’ academic contracts. This entry was posted in UCU and tagged strike, UCU on May 10, 2016 by unionadmin. 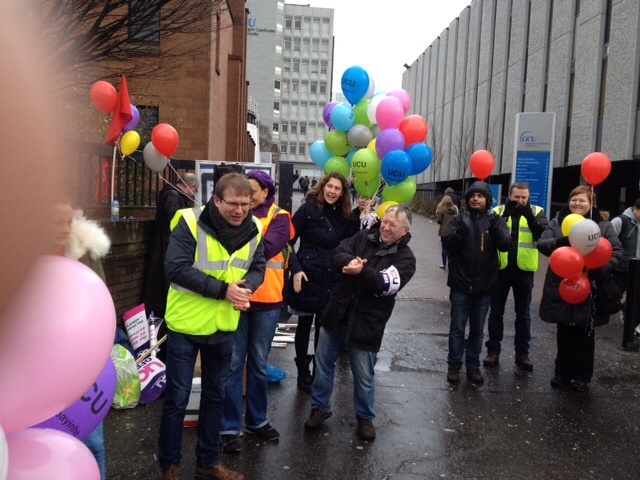 Trade Unions at GCU today sent greetings to the GCU students who are nearing the end of their elections for their local student association officers, and pledged to continue to work with the new officers in the interests of the staff, students and the wider University. “We are really pleased to see what appears to be such a vigorous campaign involving the maximum of students – we look forward with interest to the outcome, and to working together in the next period as we have in the past. 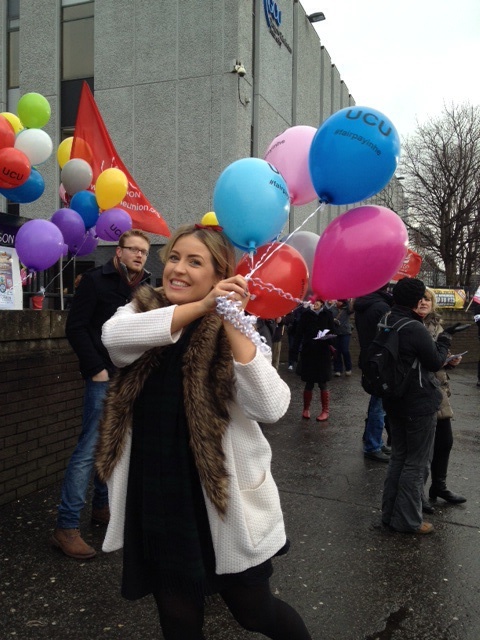 Students have benefited from the support of trade unions here, who have consistently argued for better resources to be put at their disposal. This entry was posted in Combined Union Committee, NUS and tagged Combined Union Committee, strike, Students on March 6, 2014 by unionadmin. Monday 10th February’s 2 hour strike will be used imaginatively by UCU members to host a debate on the issues raised by the forthcoming referendum. Although the UCU’s position is neutral on the outcome of the referendum, save for values and policies they demand are upheld whatever the outcome – as seen in their manifesto, it was suggested that it could be useful to explore the various options. Meanwhile staff were extremely surprised to see the GCU logo being used to publicise a speech against independence made by David Cameron. This identification of the university with one side or other of the debate has been commented on by several people including ex BBC news anchor Derek Bateman, the pro-independence website Newsnetscotland, and also by the GCU Student VP Education in his blog. It is expected that the GCU trade unions will discuss the implications of this for the reputation and standing of the university with management in the coming days. 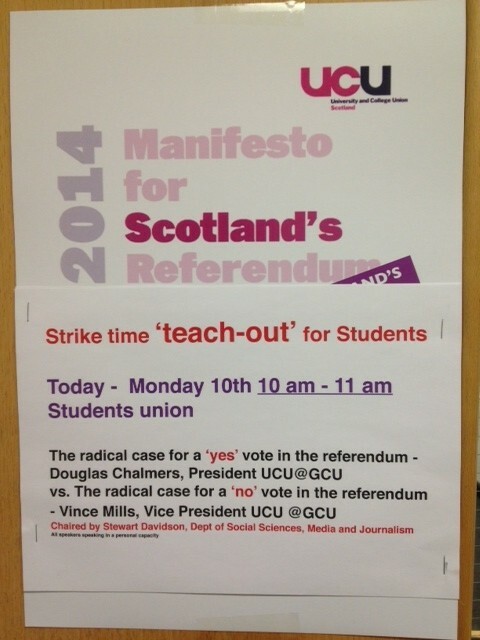 Please support the UCU strike 9 – 11 am Monday 10th November, and attend the ‘Teach-out’ in the Students association building from 10am till 11am. 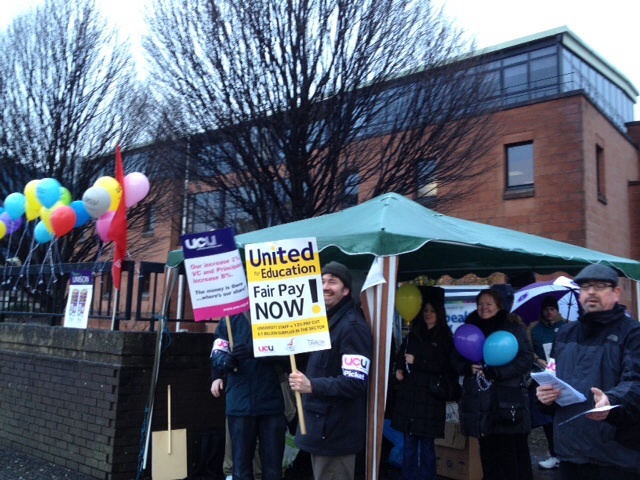 This entry was posted in UCU, Uncategorized and tagged Scotland's Future, strike, UCU on February 9, 2014 by unionadmin.